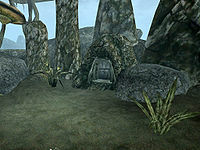 By the Third Era, most of the cavern had been converted into the Corprusarium, [UOL 1] which would house victims of Corprus, the "divine disease". One such resident was Yagrum Bagarn, the last Dwemer. An unconnected section of Abanabi remained accessible from the surface. 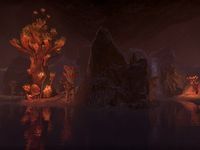 It is unknown if this section of the cave which shares its name was once connected to area Divayth Fyr would convert to the Corprusarium. It would become occupied by a pair of hostile sorceresses. One of these sorceresses, Draramu Hloran, came into possession of Chrysamere, although it was recovered from her by the Nerevarine in 3E 427 at the request of the Imperial Legion. This page was last modified on 15 November 2018, at 00:52.